Emergency Preparedness - Page 2 of 70 - A survival kit is not something you figure out when an emergency happens. How much food do you have in your home right now? If you had no way to buy more, for how long could you feed your family using only what you have at this moment? If it is anything less than a couple of weeks, you really need to consider stocking up. Sure, you could subsist on bagged popcorn and nachos for a day or two, if you really had to do so. But, there are many relatively common types of disasters that could strand you and your family at home for several days. A few years ago, this happened to a friend of mine. A huge ice storm hit her area. It caused widespread power outages that lasted for weeks. While roads were relatively save to travel after a couple of days, there just wasn’t anyplace to go as stores weren’t open due to the lack of electricity. I’m not suggesting you go out and buy a couple of pallets of freeze-dried food to squirrel away down in the basement. In fact, I would caution you against any action like that. Instead, follow a couple of proven caveats when it comes to food storage. Instead of purchasing a ton of stuff you’ve never had before, stick with the foods you and your family enjoy, just keep more of it on hand. That said, concentrate your long-term food storage on items that, well, last a long time on the shelf. Things like rice, pasta, and canned goods like veggies, fruit, and soups. Look, the fact is that our bodies grow accustomed to eating certain foods. Toss in something new and our digestive system sometimes gets…confused. Often, the result is we feel sick, sometimes only mildly so but other times it can get pretty bad. If the power is out and the water pressure is sketchy at best, do you really want to add stomach upset to the mix? Storing the foods you regularly eat helps with rotating the supply so things don’t go bad before they’re used. There are various systems people use to keep their long-term food storage up to date. Some create massive spreadsheets on the computer and religiously change the quantities as items are purchased or consumed. Others just have a notebook kept in the pantry and pencil in changes as necessary. Another tactic is to use a marker to date every item put into the pantry so they can be sure to always use the oldest stuff first. However you accomplish it, the important thing here is to use and replace food before it gets stale or goes bad in some way. Having a massive pantry won’t do you much good if the food is only marginally edible by the time you need it. Can you cook without a nuke machine? Bear in mind that if the power is out, your microwave oven, as well as your electric stove top, won’t be options for cooking your emergency food supplies. With that in mind, there are several options available, from charcoal or propane grills to camp stoves. If you have a spot to make one, even a campfire will work. Whichever methods you plan to utilize, and note the plural there, as you shouldn’t rely on just one single solution, be sure to have plenty of fuel on hand. Personally, I keep a minimum of two propane tanks for my grill filled at all times, rotating them out and refilling them as needed. I also have several bags of charcoal for my kettle grill. On top of that, I have a camp stove and a patio fire pit. Emergency food storage is important, as is having plenty of water, first aid supplies, and other gear on hand in the event of a crisis. Even the U.S. Federal government is requesting citizens to have enough supplies on hand to meet their own needs for up to three days, at a minimum. As we’ve seen in the wake of disasters like Hurricane Katrina, that three days can stretch out to several weeks rather easily. With the recent beheadings by the terrorist group calling themselves ISIS, the world has received a wake up call to the most extreme of extremists. Their ultimate goal is to create a caliphate in the middle east and then to spread its reach to the entire world. These are not cave dwellers with a half baked plan and delusions of grandeur. They’ve already militarily taken over a large portion of Syria and a large swath of neighboring Iraq. The humanitarian bombings of the US to help stranded civilians has done little to nothing in stopping their advances. Indeed, they are holding major cities and towns within Iraq and have kept them for some time now. Other countries, including Britain and Australia, have stated they have credible information on impending threats of attack. The US, thus far, has not raised it’s threat level stating they have no specific information on any imminent attacks. With the southern border easily infiltrated, it won’t be any surprise when an attack occurs on US soil either by someone who has gotten through the border or by a cell already inside the country. Large scale targets can be mass casualties in any major city or by simply disrupting the electrical grid system causing massive power outages across the country. Experts have been saying for years how vulnerable our country is to this kind of attack. A major impact would be its disruption of the distribution of food and water. Grocery stores would not get restocked, thus preventing people from getting their nutrition in the only way they know how. If there is a large scale power outage that affects a large portion of the country, the food in people’s refrigerators and freezers would not last and citizens would have no way of getting more food to eat. They would literally starve. While nice to think and try to believe that things like this can never happen, it has already happened. It’s happening right now in Syria and in Iraq. And if the terrorists get their way, it will happen in other parts of the world as well. Stocking up on food and water doesn’t seem so crazy when real threats like this exist. Many of our readers here and those akin to preparing for contingencies such as hurricanes and other forms of natural disaster have most likely already started a food storage program for themselves and their family. It’s like an insurance policy that pays you in food to eat when enacted. 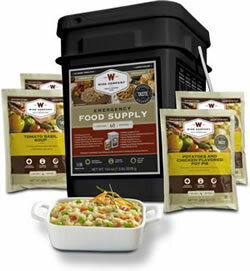 Freeze dried food purchased beforehand gives you that insurance policy that you don’t have to cash in for up to 25 years. That’s how long it lasts and can be there for you when you really need it. Our recommendation is Wise Food Company Gourmet Meals. They are chef designed and pre-prepared. All you need to do is add water.